Due to abuses by offshore and U.S. based gray market counterfeiters, the U.S. government has imposed a new marking standard for MS part numbers. Franchised and approved sources are now marking MIL-STD connectors with a ‘J ‘ prefix. The MS prefix was never copyrighted and was being duplicated by unscrupulous counterfeiters. The U.S. government has now protected the JMS call out – just as they had previously done for the older JAN call out. 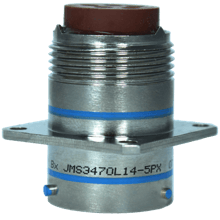 For example, if you order a MS3470L14-5PX connector, the connector itself will come marked JMS3470L14-5PX signifying that it is an authentic mil-spec part.